Bob and Janice Fera took this photo of the nebulae IC 59 and 63 between Sept. 4 and 7, from Eagle Ridge Observatory in Foresthill, Calif. They used an Officina Stellare RC-360AST 14" f/8 Ritchey Chretien Cassegrain telescope with a two-element field flattener to observe the nebula. An Apogee Alta U16M CCD camera with Astrodon filters was used to capture the photo. 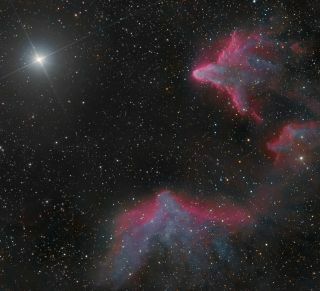 Two nebulas beam from the constellation Cassiopeia in this spectacular image captured by veteran stargazers. Easily recognizable due to its “W” shape and bright, glimmering stars, the constellation Cassiopeia is named after a mythical Greek queen who boasted about her beauty. Forming a triangle with the nebulas IC 59 and IC 63, Gamma Cassiopeia is one of these bright stars. It is also the primary light source illuminating the nebulas. Photographers Bob and Janice Fera took this photo of IC 59 and 63 between Sept. 4 and 7, from Eagle Ridge Observatory in Foresthill, Calif. They used an Officina Stellare RC-360AST 14" f/8 Ritchey Chretien Cassegrain telescope with a two-element field flattener to observe the nebula. An Apogee Alta U16M CCD camera with Astrodon filters was used to capture the photo.